The situation regarding the programmed vs non-programmed aging controversy in the commercial world (doctors, patients, pharmaceutical companies) is very different from the situation in the academic world. Patients and doctors tend to be relatively unconcerned about obscure nuances in the theoretical basis of a treatment approach and much more concerned with effectiveness and lack of adverse side-effects. Certification of drugs and treatments generally does not involve extensive theoretical discussion but rather demonstration of effectivity and reasonable side effects. Commercial operations are much more private and internal thinking about the theoretical basis of some treatment development effort can be closely held. During the long period during which programmed aging was virtually universally thought to be theoretically impossible, it was entirely reasonable for a pharmaceutical company dealing with age-related diseases to invest all of its resources into research based on non-programmed aging concepts. A programmed aging approach involves interfering with the operation of a biological program, likely to be similar to other programs and involving signaling, hormones, receptors, proteins, etc. This is a relatively familiar problem. Programmed aging theories suggest that aging, per se, is a treatable condition and therefore suggest that treatments can be devised for delaying and potentially reversing at least some aging symptoms and diseases, especially in relatively older patients. Competitors (e.g. Google Calico and AbbVie) are known to be already pursuing programmed aging research. There is of course no such thing as certainty in any drug development effort. Any such research project is essentially an informed wager based on the available information. Given the foregoing it seems unlikely that any larger pharmaceutical company dealing in age-related diseases and conditions would conclude that they can completely ignore programmed aging concepts in developing their research planning. Programmed aging researchers may go from being semi-pariahs to being in high demand! Are we likely to see the introduction of drugs that have been clinically tested and FDA approved “to delay human senescence?” This is very unlikely to happen because the claim is too broad, the claim is controversial, and the claim is extremely difficult to prove. We are much more likely to see a drug claim along the lines of: “reduces the adverse effects of macular degeneration in certain elderly patients.” Notice the narrow claim, much easier clinical demonstration, and lack of controversial claims. In addition, for programmatic reasons companies would be likely to want to develop 50 drugs to treat 50 different diseases and conditions of aging as opposed to one or a few drugs to treat senescence. Conclusion: We can expect to see increasing efforts by pharmaceutical companies to explore drug development based on programmed aging concepts. 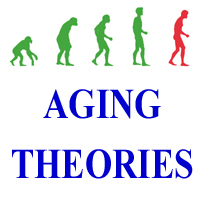 Thinking about theories of aging in humans and other mammals in the academic gerontology and more general bioscience community now centers around two concepts: Aging (and an organism-design-limited lifespan) is genetically programmed and an adaptation because limiting lifespan created an evolutionary advantage, or, it is not. Opinions in the gerontology community tend to be highly polarized on this issue. Members of the programmed aging faction tend to think that current published science overwhelmingly supports programmed aging. Many members of the non-programmed faction consider programmed aging to be scientifically ridiculous because it conflicts with evolution theory as generally understood. Some non-programmed proponents have compared programmed aging to popular but scientifically ridiculous concepts about evolution such as creationism and intelligent design. Non-programmed aging is still more popular in the academic community and general science-aware public but programmed aging provides a better match to empirical evidence. Life in the academic world is very public; we could say “publish or perish.” The scientific journal system including peer review is widely seen as necessary to maintain scientific integrity, especially for articles describing experimental or observational results and procedures. However, the system is less amenable to theoretical work. The “peer” review process tends to work against publication of new or unpopular ideas and some gerontology journals effectively will not accept articles that favorably describe programmed aging. Gerontology journal editorial boards are usually staffed by senior people who tend to follow older theories, in this case non-programmed theories, and often contain dedicated proponents of and even authors of non-programmed theories. This creates a rather hostile academic work environment for one considering performing research in programmed aging. Publicly declaring a belief in programmed aging could well amount to career suicide if one’s boss or institution thinks that programmed aging is “nuts.” Few researchers can afford to follow such a path. In addition, the vast majority of the science-aware general public has essentially been trained to believe in non-programmed aging. No institution wants to be seen as performing research that is widely seen as scientifically ridiculous. Funding sources do not want to be seen as funding junk science. Only a few research institutions publicly support the idea that human aging is genetically programmed because such a design created an evolutionary advantage. One such is Moscow State University. Nobel-prize-winning physicist Max Planck famously said: “A new scientific truth does not triumph by convincing its opponents and making them see the light, but rather because its opponents eventually die, and a new generation grows up that is familiar with it.” Younger researchers are more likely to follow programmed aging concepts. One workaround for the journal problems that has proved successful is for a journal to host a special issue to specifically compare opposing schools of thought, in this case programmed vs. non-programmed aging. Authors for both sides can then be assured that their review is going to be performed by someone who is in their faction and that therefore rejection is not preordained. In addition this creates a useful “shoot out” context where readers can compare multiple pro and con arguments. See example . Note that this requires the journal to concede that programmed aging has attained a level of scientific plausibility that at least justifies serious discussion. Some journals (like Elsevier Medical Hypotheses) are specifically designed to allow reviewed publication of unpopular theories using a modified review process. Until about 2005 many senior gerontologists dismissed programmed aging as ridiculous and “impossible” without providing any attempt at serious rebuttal or refutation of arguments and claims by programmed aging proponents. However, some senior non-programmed proponents now concede that programmed aging is possible “under certain circumstances’ and are arguing details, a significant change in attitude . Conclusion: No one would be surprised if the endless academic arguments regarding the programmed vs. non-programmed nature of aging continued for another 150 years! However, venues for publication of programmed aging articles are increasing and the programmed aging faction is growing in size, popularity, and impact. The research environment in the commercial world (e.g. pharmaceutical companies) is much more favorable to programmed aging as will be discussed in a companion article. Curr Biol. 2011 Sep 27;21(18):R701-7. Kirkwood TB, Melov S. On the programmed/non-programmed nature of ageing within the life history. Medicine is largely an exercise in cause and effect. Because senescence has such a diffuse and multi-symptom nature and also is of such a long-term nature, it is probably the most difficult area of medicine in which to establish cause-and-effect relationships. This is one reason that theories of aging that suggest research directions are so critical to the development of treatments for age-related diseases and conditions. The term anti-aging medicine means different things to different people. Many see “anti-aging medicine” as essentially a cosmetic or esthetics effort. We can delay the appearance of aging with tummy-tucks, face lifts, and Botox. Another view is towards “healthy aging,” or “better aging.” We can work to extend the healthy and happy portion of our lives and decrease the length of the nursing-home-stage but not necessarily live much longer. Life-style modification including exercise and diet are frequently part of this approach. Lifestyle protocols are not very controversial; most physicians favor less obesity, healthy diet, more exercise, a generally more active life, and avoiding dangerous behaviors like smoking, alcoholism and drug abuse. There is wide respect for a “use it or lose it” concept in which exercise and activity are beneficial. Even exercising a person’s mind is thought to delay age-related mental deficits. Finally, some are looking toward essentially treating aging, per se, and delaying the age at which manifestations of aging would otherwise appear in a particular individual. Some consider that such manifestations are reversible and that regenerative medicine could reverse or reduce some symptoms of aging including age-related diseases. Average and maximum human lifespan could be extended. Since there is little actual clinical evidence of pharmaceutically extending maximum human lifespan and this idea is unpopular in the general public and the medical community, most practitioners are careful not to make extravagant claims in this area. Treating aging, per se, might be expected to have more obvious effects on older people. In a twist to this idea, it is widely agreed that senescence is largely an inherited characteristic and varies between individuals. The old saw goes: “If you want to live a long life, choose long-lived parents.” An anti-aging practitioner might say “Your hormone levels are not typical for a person your age and need to be adjusted. Of course, if that is a valid approach, the patient might say: “I would like to have my hormone levels adjusted to those of a typical 110-year-old or whatever levels the 110-year-old had when they were my age!” See more on hormones below. The thousands of prescription drugs are tested and certified for use in treating a particular disease or condition. However, a physician can prescribe most prescription drugs “off book” for other uses. In addition there are thousands of over-the-counter non-prescription drugs thought to be beneficial in treating some disease or condition as well as thousands of foods and substances sold by vitamin and health food stores also thought to have beneficial effects. Hard evidence of effectiveness such as double-blind clinical trials is usually much less available on the non-prescription substances. Programmed aging theories suggest that aging is substantially the result of a biological mechanism and therefore that agents can be found that affect this mechanism just as they can be found for treating the disease and condition-specific mechanisms. As programmed aging theories become more popular we can expect to see many substances suspected of having anti-aging properties. Because it is progressively harder to establish cause and effect for anti-aging agents in longer-lived organisms such as humans a lot of the evidence will be coming from experiments with shorter-lived organisms such a mice (~2.5 years), some short-lived fish species (8 weeks), even worms and flies that may or may not be directly applicable to humans. Agents can also be evaluated by measuring their effect on senescence indicators such as telomere length, hormone levels, etc. Non-programmed theories suggest that anti-damage agents such as anti-oxidants or anti-inflammatory agents might be effective. The US National Institutes of Health (NIH) National Institute on Aging (NIA) is operating a search for anti-aging agents that they call the Interventions Testing Program. Oral agents are tested in mice and evaluated for effects on lifespan. This program can only evaluate a few agents per year and does not deal with injected agents or experiments that require special handling such as exercise regimens. Human testing in elderly subjects might provide relatively rapid results depending on the nature of the aging mechanism. For example if aging is reversible, such testing may provide measurable results in a short period. Suspected anti-aging agents include: rapamycin, metformin, resveratrol, vitamin D3, Cycloastragenol, and deprenyl. Because some suspected anti-aging agents apparently have few side-effects large scale human trials are possible. Programmed aging theories suggest that aging is the result of a biological program that purposely causes or allows manifestations of aging to appear on a species-specific schedule. If this program is similar to other biological programs such as the ones involved in reproduction, or glucose metabolism, or circadian rhythms, or stress responses, then it is likely that some part of our body determines when to apply the aging function and sends signals to other parts to implement the function. These signals can be nervous or chemical (hormonal) in nature and hormone signals are typically distributed in blood plasma. Therefore, if aging is programmed we could logically expect to see “age” or “don’t age” signals (or both) in blood plasma. Indeed, many human hormones are observed to either decrease or increase with age. Experiments have been performed in which tissue from older animals is exposed to plasma from young animals. Senescence markers were observed to change in response. Heterochronic plasma exchange (HPE), or infusion of young plasma into old patients (or infusion of old plasma into young animals) is being explored as a way to study anti-aging effects of blood factors. The advantage of this approach is that is not necessary to understand which hormones are involved or exactly how they work in order to demonstrate an anti-aging effect. HPE trials could also result in near-term anti-aging treatments. See Young Blood Institute and Ambrosia Company. Therapeutic plasma infusion is a recognized technique used in treatment of various diseases. However, the trials and prospects for treatments are highly controversial, at least partly because of attitudes described in companion articles. Any signaling scheme must have means for both asserting and removing the signal. Hormone concentrations naturally decay. Some hormones are cancelled by other associated hormones and endocrinology is a complex subject. It is therefore somewhat unclear if plasma therapy would have beneficial effects for long enough to be practical. The importance of this issue depends on which hormones are actually important in aging. “The American Academy of Anti-Aging Medicine (A4M) is dedicated to the advancement of tools, technology, and transformations in healthcare that can detect, treat, and prevent diseases associated with aging. A4M further promotes the research of practices and protocols that have the potential to optimize the human aging process. The organization is also dedicated to educating healthcare professionals and practitioners, scientists, and members of the public on biomedical sciences, breakthrough technologies, and medical protocols through our advanced education entity: Metabolic Medical Institute (MMI). A4M is a U.S. federally registered 501(c)(3) non-profit organization comprised of over 26,000 members across the globe, including physicians (85%), scientists and researchers (12%) , and governmental officials, media, and general public (3%), all of whom collectively represent over 120 nations. A4M is focused on spreading awareness about innovative, cutting-edge science and research, in addition to treatment modalities designed to prolong the human life span. The core of the NEW medicine is based on scientific principles of comprehensive medical care, which encompass many other specialties within healthcare. Telomeres are the “end caps” on chromosome molecules that tend to shorten with age. Since the 1960s age-related telomere shortening has been suspected as part of an aging mechanism. Telomerase is a naturally occurring enzyme that repairs (lengthens) telomeres. “Telomerase activators” that stimulate production of telomerase and therefore increase telomere length are in use by some anti-aging practitioners. Clinical trials show that these oral medications do increase telomere length but actual lifespan extension is much harder to demonstrate. Age-related changes in hormones are specifically suggested by programmed theories as parts of a programmed aging mechanism. Since many human hormones decrease with age and some increase with age enhancing concentrations of the former and interfering with the latter are obvious possibilities for an anti-aging treatment. However, hormone replacement (estrogen, testosterone, “steroids”) has been historically associated with significant adverse side-effects. BHRT practitioners suggest that this problem has been reduced or eliminated by using a different “bio-identical” form of the hormone(s) and using reduced dosage relative to the earlier treatments. Conclusion: It is possible that therapies and agents that already exist have some effect in treating aging, per se, and therefore produce lifespan extension. However the extreme difficulty in establishing definitive cause and effect evidence and current unpopularity of this idea (see companion articles index) suggest that no definite medical conclusions can be expected in the near future. Plausibility of such result depends heavily on which of the many aging theories one accepts. Trials of therapies and agents that have a reasonable demonstration of safety in relatively elderly patients appear to have the best prospects for demonstrating effectiveness in this area. 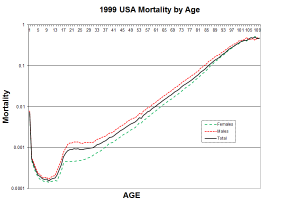 As can be seen from the figure (U.S. mortality data), human death rates from all causes in developed countries increase exponentially starting at about age 30 and doubling approximately every ten years. We can define age-related disease or condition as one where the incidence and severity drastically increase with age to the point where aging is by far the main cause. Massively age-related diseases include heart disease, stroke, cancer, arthritis, cataracts and other vision deterioration, hearing loss, and loss of strength and balance. Alzheimer’s disease is essentially unknown in young people. Death rates for 40-year-olds are approximately twice the rates for 30-year-olds so we can consider that nominally half of deaths in 40-year-olds are caused by aging along with three-quarters of deaths of 50-year-olds and so forth. Aging and age-related diseases cause about three-quarters of all deaths in developed countries and represent more than half of medical research and health-care costs. There is wide agreement that there are different immediate or direct causes associated with each age-related disease and condition. The immediate causes of heart disease are not the same as the causes of cancer or the causes of arthritis, etc. Western medicine is largely based on the idea that we need to find different treatments and pharmaceutical agents to treat different diseases and conditions. This approach has obviously been substantially successful in treating age-related diseases. The current trillion-dollar question is whether or not aging, per se, although obviously the main cause of the age-related diseases is itself a treatable condition. If so, treatment of aging could be used in parallel with the existing medical paradigm in our efforts to treat age-related diseases and conditions. As described below, different aging theories suggest drastically different answers to this question. Fundamental limitation theories, wear and tear, stochastic, etc. strongly suggest that aging is an untreatable condition. We can find treatments for individual symptoms such as cancer and heart disease but we cannot find ways to treat aging, per se, as it is the result of fundamental limitations that could not be overcome by the evolution process and are very unlikely to be overcome by medical advances. Modern non-programmed aging theories suggest that aging is not the result of fundamental limitations but rather the result of a large number of different independent factors as explained by George Williams in 1957. Unlike inanimate objects, living organisms obviously have many biological mechanisms for repairing or preventing damage. Wounds heal; dead cells are replaced; immunity is acquired, and so forth. Therefore humans and other organisms reasonably would have developed biological mechanisms to delay the appearance of cancer, other methods for dealing with the different damage mechanisms associated with heart disease, and myriad other mechanisms for delaying the occurrence of other age-related diseases and conditions. This concept explains why different mammals have such different internally determined lifespans while having very similar biochemistry and similar symptoms of aging. This idea assumes that all of the different maintenance and repair mechanisms each presumably independently evolved and retained just the effectiveness needed to deliver the minimum necessary species-specific internally-determined lifespan called for by modern non-programmed theories based on Medawar’s evolutionary mechanics ideas. These concepts support the accepted idea that we can find different ways to treat each specific age-related disease. However, these concepts suggest that there is some ultimate age beyond which further progress in extending human lifespan would cease because eventually every aging symptom would appear at catastrophic levels. They further suggest that there is no treatable common factor behind age-related diseases and conditions. These theories therefore support the current medical paradigm of ever-increasing specialization by disease, disease sub-type, and even personal disease variety. Modern programmed aging theories suggest that a second path toward combating age-related diseases and conditions exists. These theories propose that the age-related diseases and conditions are coordinated by a biological aging program that stages the appearance of aging symptoms to result in a particular optimum lifespan for each species population. In addition to finding better ways to combat each particular disease we can look for ways to interfere with the aging program and therefore generally delay or reduce the severity of age-related diseases especially in older individuals. If valid, this is an exciting development because two different approaches can be used against age-related diseases. Because the anti-aging approach is new, we could reasonably expect “low hanging fruit” and rapid progress. The effectiveness of an attempt to interfere with the aging program depends on one’s concept of the nature of that program and specifically the degree to which the program is common to the many age-related diseases and conditions and the extent to which the common program can control each symptom. For example, if senescence is controlled by a program similar to the one that controls mammal reproduction, and aging is a genetically programmed phase of life, then we could expect rather dramatic results. If we wanted to delay or advance puberty that would certainly be possible. There is considerable theoretical thinking and empirical evidence suggesting that, like reproduction, aging is controlled by a complex common program involving signaling (hormones). There is fairly wide sentiment to the effect that aging can be generally delayed by exercise and perhaps by caloric restriction. This idea conflicts with non-programmed “damage” theories because exercise and caloric restriction would be expected to increase, not decrease, damage. Many other observations support programmed aging.